Two prominent Iranian Americans Dr. Firouz Naderi and engineer Anousheh Ansari say they are honoured to represent Iranian filmmaker Asghar Farhadi’s “The Salesman” at the upcoming Oscars ceremony. Farhadi, whose “The Salesman” is nominated for the foreign-language film Oscar, had announced several weeks ago that he would boycott the Oscars ceremony to protest US President Trump’s travel ban, even if exceptions were made to allow him entry to the US. 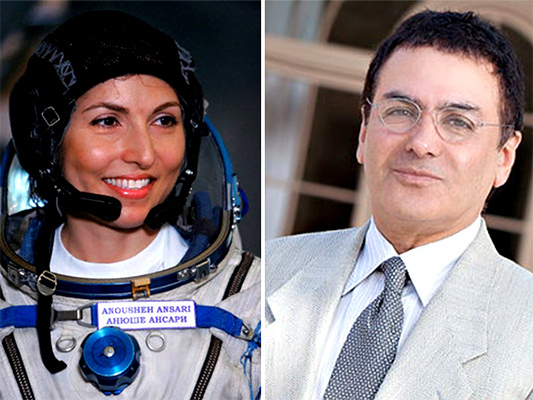 Later, he chose two prominent Iranian Americans, Anousheh Ansari, known as the first female space tourist, and Dr. Firouz Naderi, the former director of Solar Systems Exploration at NASA, to represent his film “The Salesman” at the upcoming Oscars ceremony. “Mr. Farhadi who is nominated for his brilliant film “The Salesman” has announced that as a protest against Donald Trump’s travel ban he will not attend the Oscar ceremonies this Sunday in Hollywood. He has asked Anousheh Ansari and I to attend in his place and talk to the press — which we are delighted to do. Should the film win, one of us will accept the award on his behalf,” Naderi noted. “My hat is off to him for standing by his principles,” he added. Born in Iran, Ansari moved to the US in 1984 as a teenager, five years after the Islamic Revolution. She made global headlines in 2006 when she became the first female private space explorer, as her website puts it, by boarding a Russian Soyuz spacecraft for an eight-day expedition, becoming the first Iranian and also the first Muslim woman in space. At the insistence of NASA and Russian officials, she did not wear the Iranian flag officially at launch. She wore Iranian flag colours instead, and kept the Iranian flag on her official flight patch. Ansari and her husband said no political message was intended, despite rising tensions at the time between Washington and Tehran, Variety wrote. Naderi, who was also born in Iran and who left for the US in 1964, spent more than 30 years in various positions at NASA, including director of Solar Systems Exploration and manager of NASA’s Mars Exploration Program. He left NASA in 2016 and is currently a management consultant.